Scientists from Tomsk Polytechnic University are creating osteo- and immunostimulating materials for personalized medicine at polytrauma complicated by various pathologies. Recently, the project has been supported by a grant for postdoc researchers, i.e. next four years it will be carried out within the TPU Laboratory for Plasma Hybrid Systems. The body of each person has its individual characteristics. For example, after endoprosthetic surgery many patients have got such complications as pain and loosening the elements of endoprosthesis. These symptoms are typical for metallosis caused by the implantation of metal implants into the human body. Among the older people, the most common disease is osteoporosis. A lower density of bone tissue characterizes it and as a result, a higher brittleness of skeleton bones, that leads to loosening the implant. ‘Surgeons operating such patients are tasked both to replace lost bones with implants and prevent unwanted reactions in the body, thus to reduce the risk of rejection. In the project our team is working on the creation of a material which will facilitate regeneration of bone tissue and stimulate the immune system through of the inclusion of drugs into its structure. This will significantly shorten the period of rehabilitation. According to the TPU researchers, the development of such materials is an urgent task throughout the world. They will help to eliminate allergic reactions, infection of wounds and rejection of implants during surgical interventions in patients who injured bones and internal organs due to various accidents, falls from heights, injuries in shooting wars, as well as bone metastasis resulting from cancer. 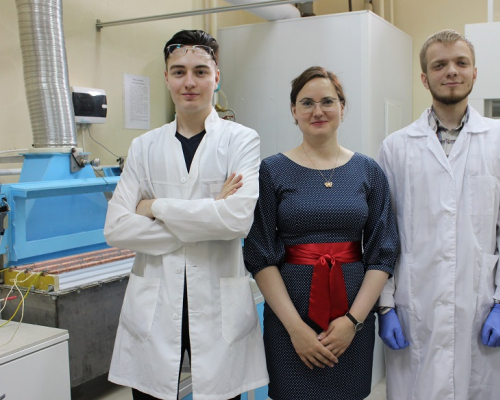 Anna Kozelskaya’s team consists of Alexander Fedotkin, an engineer at the School of Nuclear Science & Engineering and Viktor Smirnov, a three-year student from the School of Advanced Manufacturing Technologies.